Some members of the Ligue des avions miniatures de Montréal examining the radio controlled model then under construction. Christian Verdon, “Avion-miniature contrôlé par la radio.” La Patrie, 7 January 1939, 44. What is it, my reading friend? You seem pretty perky today. Could this be because this week’s topic has to do with aeronautics, one of the fields of activity of the world-famous Canada Aviation and Space Museum of Ottawa, Ontario? Yes, yes, do not deny it, you were thinking about that. I’m very glad, for the moment has come to plunge into said subject. Yours truly found it in the pages of the 7 January 1939 issue of La Patrie, a long vanished Montréal daily. Modelling / model-making was / is one of the most interesting aspects of the fascination inspired by human flight for more than 2 centuries. Let’s not forget that the first model capable of flying took to the sky in 1804. The designer of this glider was none other than Sir George Cayley, the father of aeronautics and a gentleman mentioned in a December 2018 issue of our blog / bulletin / thingee. And no, my reading friend fascinated by fortean phenomena, yours truly does not believe that the Saqqara bird, mentioned in the same December 2018 issue of our blog / bulletin / thingee, was a glider. Should I remind you that the term fortean was mentioned and explained in an October 2018 issue of our blog / bulletin / thingee? And yes, my perspicacious reading friend, I love thingees. There were / are many types of scale models capable of flying, from the simple silhouette of balsa wood to miniature motorised and remotely controlled aircraft. In fact, yours truly wonders where was / is the limit between a miniature motorised and remotely controlled aircraft and a drone / pilotless aircraft / remotely piloted vehicle / unmanned aerial vehicle. What do you think? This being said (typed? ), the scale model universe far exceeded / exceeds the galaxy of models capable of flying. Since the photo at the beginning of this article showed such an aircraft, yours truly will limit himself to this type of scale model for today’s pontification. I realise how disappointed, or relieved, you are, but you will have to accept this fact. A new type of scale model, much more complex and expensive than those existing until then, appeared in the United States in the early 1930s: the scale model with a gasoline engine. The introduction of this type of engine revolutionized modelling. Issues of various magazines contained advertisements of various manufacturers. An International Gas Model Airplane Association and a Model Industry Association were formed in the United States in 1936 and 1940. As of 2019, these 2 organizations were known as the Academy of Model Aeronautics and the Craft and Hobby Association. One of the first, if not the first gas-powered scale model in Canada was built around 1931. Made by Foster Stone of Moose Jaw, Saskatchewan, this aircraft lacked power. The young man continued his work with a more powerful engine, however. Some other people or clubs took the plunge from 1935-36 onward. The first competition was held in Vancouver, British Columbia, in 1936 and the first specialised club in Canada, the Canadian Gas Model Club of Toronto, Ontario, was created no later than 1937, to oversee this new type of modelling. If the hopes of his management were quickly disappointed, the club remained somewhat active during the Second World War. It had to count on a rival organization, however, the Toronto Gas Model Club, founded in early 1942 by a good half-dozen dissident members. A Toronto family with a passion for modelling seemed to be behind the Canadian Gas Model Club. In 1944, the 6 members of the Hockin clan, the father, mother, and 4 children, including a teenage girl, made scale models, some of which had a gasoline engine. Lillian Hockin played an important role in the founding of the Canadian Gas Model Club. The young woman was also its secretary during the period between 1939 and 1950 or so. Her contribution was considered so important that she was the first woman to be inducted into the Model Aeronautics Association of Canada Hall of Fame. Hockin was still its only female member in 2019. Her mother, “Ma” Hockin, was one of the founding members of the Model Aeronautics Association of Canada (MAAC). By the way, the MAAC was established in Toronto in January 1949 under the sponsorship of the Royal Canadian Flying Clubs Association. Its objectives were the control, organisation and promotion of modelling in Canada. This organization still existed in 2019. Robert E. “Bob” Milligan of Toronto was one of Canada’s pioneers in the production of gasoline powered scale models. He was one of the best Canadian modellers of the second half of the 1930s. In 1937, Milligan won the C. C. Wakefield Trophy, in the senior teen section, as well as the Sir Charles Wakefield Trophy, another Canadian national award. He was part of the Canadian team participating in the 1938 edition of the Wakefield International Cup, a competition for scale models powered by a rubber band. Milligan was the best of them. That same year, he designed a scale model with a gasoline engine. This prototype gave birth to another scale model, known as the Wasp. Model Craft Hobbies Limited of Toronto offered a kit version of this aircraft around 1939 – a Canadian first. The Milligan Wasp was still available in 2019. Milligan was part of the Ontario team of 6 modellers going to Akron, Ohio, to compete in the 1948 Wakefield International Cup, the first post-war edition. He was again the best of them, with a 5th place. After moving to California at an indeterminate date, he remained active until at least the mid-1990s. Does the name Wakefield ring a bell, my reading friend? Yes, you’re absolutely right, this founder of C.C. Wakefield & Company Limited, a leading British supplier of lubricating oils, was mentioned in a February 2018 issue of blog / bulletin / thingee, but let’s get back to our story, and ... Did you have a question, my slightly puzzled reading friend? When will the Ligue des avions miniatures de Montréal be mentioned, you ask? Fear not, we are getting there, slowly but surely. Another member of the team participating in the 1948 edition of the Wakefield International Cup, Roy Percy Nelder, finished in 25th position. In 1938 and 1939, he had won the Admiral Moffett Trophy, awarded to the winner of an international competition for scale models powered by a rubber band. This young Torontonian of British origin enlisted in the Royal Canadian Air Force during the Second World War. He was one of the most famous Canadian modellers of the late 1940s. Nelder was one of the engineers working on the CF-105 Arrow, the supersonic all-weather fighter of A.V. Roe Aircraft Limited, a subsidiary of A.V. Roe Canada Limited, itself a subsidiary of the British giant Hawker Siddeley Group Limited. Following the cancellation of this aircraft in February 1959, Nelder left Canada and worked for the Fisher Body division of General Motors Corporation. He received the MAAC Pioneer Award in 2004, but let’s go back to our digression and, more specifically, to Model Craft Hobbies. And yes, General Motors was mentioned in March and November 2018 issues of our blog / bulletin / thingee. Model Craft Hobbies was formed at an indeterminate time as the Ontario Model Aircraft Company of Toronto. 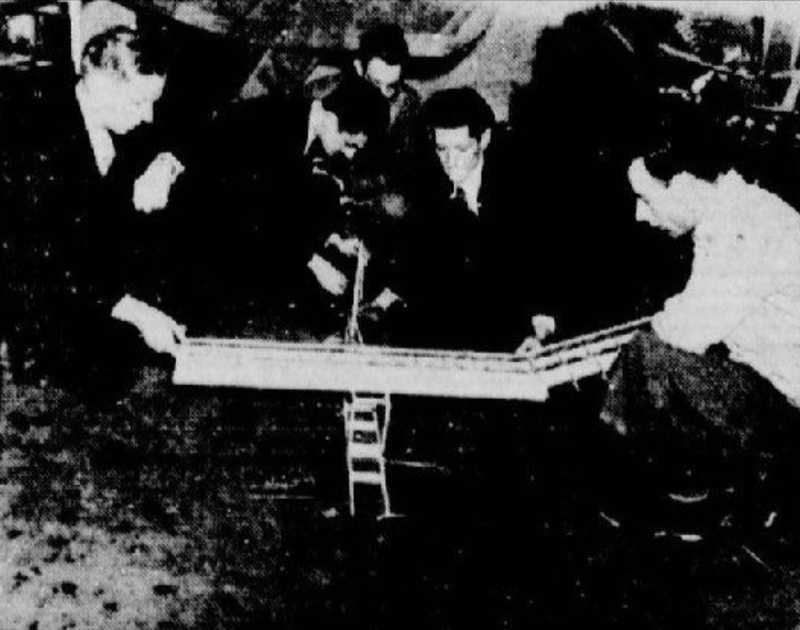 Model Craft Hobbies, which adopted its new name in early 1942, made flying scale models used by Canadian members of the Jimmie Allen Flying Club. In the spring of 1942, it produced approximately 90 000 scale models per month. By comparison, its monthly production in 1928 was about 125 scale models. What was the Jimmie Allen Flying Club, you ask, my reading friend? A good question that deserves a good answer. The fascination with aviators that permeated the United States in the early 1930s could be found on the radio, where The Air Adventures of Jimmie Allen, an adventure soap opera, aroused the enthusiasm of young listeners, both American and Canadian. Produced between 1933 and 1937 from texts written by 2 First World War pilots, the adventures of the young civilian pilot remained on the air until around 1943. A second series of Jimmie Allen adventures, sponsored by International Shoe Company and other companies, went on the air in 1946-47. The Jimmie Allen Flying Club reportedly counted up to 600 000 Jimmie Allen Cadets during the 1930s and 1940s. The Canadian sponsor of the club was British American Oil Company Limited of Toronto, a firm with no direct link to the American sponsor of this soap opera, Skelly Oil Company. The monthly newsletter sent to club members, Jimmie Allen Flying Club News, was available in a Canadian version, but in English only. British American Oil also published a brochure that could receive stamps bearing portraits of 16 Canadian pilots, mainly First World War aces and bush pilots. The Air Adventures of Jimmie Allen was the first radio show that included in its promotion scale models powered by a rubber band. About 20 official scale models were manufactured in hundreds of thousands of copies. Many young boys (and a few young girls?) who assembled them participated in races held in the United States and Canada. Two of these scale models, the B.A. Cabin / Skokie and the B.A. Parasol / J.A. Racer, were specifically designed to compete in races sponsored by British American Oil. One of the scriptwriters of The Air Adventures of Jimmie Allen created a second adventure soap opera that went on the air in early 1938. Today well forgotten, Howie Wing, A Saga of Aviation looked at the adventures of a young pilot, the Howie Wing of the title, and his friends. The sponsor of this work was a well-known American breakfast cereal manufacturer, Kellogg’s Limited. Its Canadian subsidiary, Kellogg Canada Incorporated of London, Ontario, supported it in this endeavour. The commercials inserted in each episode often used aviators well known at the time. A Howie Wing Cadet Aviation Corps was not long in coming. Anxious to publicize its soap opera, Kellogg’s organised a big contest, the winners of which, a girl and a boy, may have received as a gift the contents of 2 suitcases which, for the first time, it was said, flew around the world tour by aircraft, in the opposite direction, in February-March 1939. The creation of a very well-known radio drama, Captain Midnight, however, resulted in the departure of the scriptwriter of Howie Wing, A Saga of Aviation. The last episode went on air even before the end of 1939. That same year, Kellogg’s sponsored the broadcasting of its soap opera in Australia. Captain Midnight fascinated a great many young North American listeners between October 1939 and December 1949. In fact, the scriptwriters of Captain Midnight were the very ones who had created its predecessor. Sponsored by A. Wander Limited, the American maker of Ovaltine, or Ovomaltine, a milk flavouring product originating from Switzerland, Captain Midnight replaced the radio soap opera Little Orphan Annie, which was removed from the airwaves after 10 years of success. The new character rapidly gained in popularity. In 1942, a second tier studio produced a 15 episode movie serial. The Captain Midnight Club “Flight Patrol” ended up with more than 1 million members. Did I mention that A. Wander was a subsidiary of a Swiss company by the name of A. Wander Aktiengesellschaft? Apologies. I digress. Uh, where was I, my reading friend? I was pontificating about Canadian made scale model fitted with a gasoline engine, right? So, let’s continue. The craze for this type of flying machine was such that about 50 scale models fitted with a gasoline engine took part in a competition organized by T. Eaton Company Limited, the largest in-store retailer in Canada, which was held in the Montréal region in June 1941. One of the participants was none other than Christopher B. “Chris” Falconar and ... This name does not ring a bell, now does it? Sigh. A passionate modeller since his childhood, Falconar began his career in aeronautics during the Second World War, in the Montréal area, at Noorduyn Aviation Limited and Canadian Car and Foundry Company Limited (CCF). And yes, the major manufacturer of railway rolling stock that was CCF, mentioned in a November 2018 issue of our blog / bulletin / thingee, had been interested in aviation since the mid 1930s. If you’re nice, my reading friend, I promise to consider the possibility of pontificating about Falconar’s career at a later date. Do you have a question, my slightly impatient reading friend? When will the Ligue des avions miniatures de Montréal be mentioned, you ask? Fear not, we are getting there, slowly but surely. Before taking the road in this direction, let me mention some Canadian modelling pioneers. We are mentioning here the few enthusiasts who tried to produce gasoline engines for scale models. In 1937, Arthur Jaques of Winnipeg, Manitoba, completed the development of the Ajax engine. He produced about 20 examples of it in 1938-39. American modellers bought some of them. In fact, the mass production of engines by American manufacturers likely played a crucial role in the commercial failure of the Ajax engine. This being said (typed? ), a decision by the federal government, made during the Second World War, to ban the importation of American gasoline engines changed things somewhat. A person linked to Ontario Model Aircraft, Frank E. Lucas, was working on a gasoline engine for scale models before the end of 1940. This writer unfortunately does not know if this Model Craft Premier was produced in series. Montrealer Randall Bainbridge also took the plunge in 1940. Strato Model Engines (Incorporated ?) produced about 80 high-quality engines, despite the problems and restrictions associated with the Second World War. The last Strato engine was produced in 1946. The reintroduction of American gasoline engines into the Canadian market probably explained the commercial failure of this product. Bainbridge’s work may, however, have inspired a few people. Samuel “Sam” Crystal, owner of the small Toronto firm Merlin Miniatures Incorporated, manufactured many Super B engines between 1945 and 1947. The latest version of this engine may have been produced or assembled in the United States. Let us also mention the Salonen brothers of Vancouver. Salonen Brothers Tool & Engineering Works produced a number of Queen Bee engines between 1945 and 1948. Deeply frustrated by the massive importation of American engines into Canada, once peace returned, “Al” Salonen threw into the water the tooling used to make his engines. Let’s not forget Murray “Ray / Uncle Ray” Hunter. This Torontonian designed the best-known gasoline engines for scale models ever produced in Canada. Originally known as the Whirlwind, the Hurricane engine was popular with Canadian and American modellers as early as 1944. It was manufactured by Hunter’s company, Production & Tool Company. The introduction of the Super Hurricane and Hurricane “Hot Top” engines, in 1946 and 1948, added to the prestige of Production & Tool. Hunter also manufactured a few twin-cylinder engines as well as a few water-cooled miniature boat engines. Hunter even offered an engine, the HP Whirlwind (? ), capable of propelling a miniature military target drone. None of these projects went beyond the prototype or pre-production stage. This being said (typed? ), the Hurricane, Super Hurricane and Hurricane “Hot Top” greatly pleased modellers from several countries (Australia, Brazil, Canada, New Zealand, Portugal, South Africa, United Kingdom and United States) during the post Second World War years. The number of engines (exported?) was close to 275 000, despite the ubiquity of American engines. The production of these engines ended in 1950. Hunter sold his tooling to a Briton at an undetermined date. He was the first recipient of the M.A.A.C. Model Aviation Pioneers of Canada Award, in 2003. Modelling saw another revolution even before the end of the 1930s. Indeed, the first radio controlled scale models appeared in the United States around 1937. Several people involved in these projects were put to use during the Second World War. One only needs to think about Reginald Denny, born Reginald Leigh Dunmore. This British born movie star and former stunt pilot flew during the First World War as an observer / gunner. His company, Radioplane Company, founded in 1939, produced nearly 14 900 target drones during the Second World War. Among its staff was a young woman, Norma Jean Dougherty, born Mortenson – the future Marilyn Monroe. Interestingly enough, Denny was one of the people who, over the years, were the owners of the example of a First World War fighter airplane, the Sopwith 7F.1 Snipe, on display at the Canada Aviation and Space Museum. It should be noted that Quebecers were among the pioneers as far as the development of radio controlled scale models in Canada was concerned. A group of aviation enthusiasts founded, you guessed it, the Ligue des avions miniatures de Montréal, in October 1938. Yaaaay! Sorry. This association, which is now largely forgotten, the first and only group that brought together Canadian francophones at that time, soon has about 150 members. Starting in September 1939, its pillar and founding president, Rosaire Paquette, taught design and model making every Thursday at the Palestre nationale, a well-known Montréal-based athletic facility owned by the Association athlétique nationale de la jeunesse. It should be noted that the Ligue des avions miniatures de Montréal had no direct link with the Model Aircraft League of Montreal. The scale model completed in 1937 by future members of the Ligue des avions miniatures de Montréal. From left to right, Benjamin “Ben” Tarnopsky, Rosaire Paquette, C. Tinegord (?) and Robert Hancock “Bob” Noorduyn. Christian Verdon, “Avion-miniature contrôlé par la radio.” La Patrie, 7 January 1939, 44. During the summer of 1937, even before the formation of the league, some future members completed a huge and apparently motorised scale model. One of the team members was seemingly none other than Robert Hancock “Bob” Noorduyn, son of Robert Bernard Cornelius “Bob” Noorduyn, founder of Noorduyn Aircraft Limited and designer of a remarkable Canadian bush plane, the Noorduyn Norseman. And yes, an aircraft of this type is in the fantastic collection of the Canada Aviation and Space Museum. Paquette and a friend, Harris Pound, flew a motorized radio controlled scale model even before the start of the Second World War. This aircraft still existed in the spring of 1944. Paquette then counted among the employees of Noorduyn Aviation, a company name adopted in 1938. This radio-controlled scale model may very well have been the first flying machine of its kind in Canada. In January 1940, the league may, I repeat may, have launched a series of courses on gliding. The final goal of this training was to manufacture a glider. No information available allows me to confirm that this aircraft was completed. The Ligue des avions miniatures de Montréal disappeared on an unfortunately indeterminate date.